The host of this month’s HHDD is Tami of Running with Tweezers, the talented blogger and food stylist who won last month’s round, and two rounds before that. Yes, she is really a winner (just check out her site!) and this month she has chosen quite the winning theme: terrines. The only rule she posed was that whatever terrine we chose, be it sweet or savory, must be rectangular or loaf shaped. Colors, multiple ingredients, and layers were not required, though encouraged. 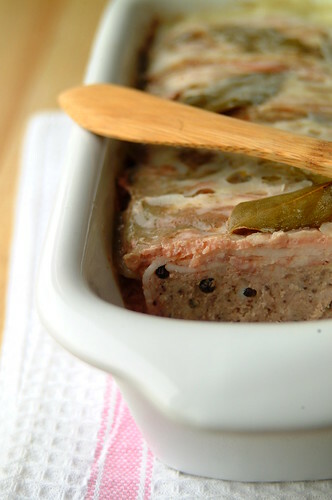 As soon as I saw the theme only one terrine popped into my head…and it wasn’t fancy or layered or colorful. Thank goodness it was rectangular! – In a bowl combine the chopped bacon, ground pork, ground veal, chicken livers, thyme, spices and brandy, and season well. Cover with plastic wrap and place in the fridge for a few hours to allow the flavors to develop. – In a frying pan over medium heat, melt the butter. Add the onion and garlic and sauté gently until onion is translucent (about 5 minutes), taking care that it doesn’t brown. Remove from the heat and set aside to cool. – Line a 30cm x 11 cm x 10 cm terrine with the remaining bacon rashers, letting the ends extend over the sides. – Remove the mince mixture from the fridge and add the cooked onion mixture and the egg, and combine well. Spoon the mixture into the prepared terrine and fold the bacon rasher back on top. Top with the bay leaves. Cover with a layer of well-buttered greaseproof paper and then wrap the whole terrine in two layers of aluminum foil. – Placed the covered terrine in a large baking tray and pour warm water until halfway up the side of the terrine. Place in a 180C oven and cook for 1 1/2 hours. – Remove from oven and set aside to cool, then place in the fridge for a few days. Serve with cornichons, bread, and some dressed greens. The terrine presently lays waiting in the fridge for tonight’s dinner. Of course, not one for unpleasant surprises, I have already tasted it. Not bad for a first-time terrine-maker I think! I do like this recipe and the flavors it incorporated…the terrine was all full-bodied bite of spices and brandy, while the liver’s essence gave the terrine its distinctive taste. I did make some changes to the recipe above: I didn’t have any mace, instead I gave it a generous grating of nutmeg. I also added whole peppercorns because I love biting into whole peppercorns in a terrine (am I alone in this?). Veal is also very expensive here, so I used regular beef mince instead.